Celebrate the sweet taste of Spring with these quick and easy strawberry recipes. Whether fresh or frozen, there’s no denying that strawberries are a popular fruit, but they also pack a healthy punch. Not only are they juicy, summery and delicious, they’re a bona fide superfood, too. 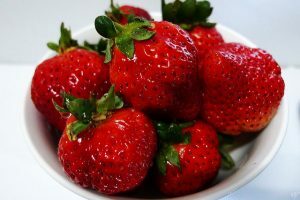 Nutrient-rich and packed with antioxidants (like vitamin C), strawberries offer a wide range of health benefits. Vitamin C is one of the antioxidants that can help with cancer prevention, since a healthy immune system is the body’s best defense. Basil is also known to have powerful antioxidant properties. The natural antioxidants found in basil can protect the body against damage from free radicals, thereby combating most forms of cancer. Basil also contains flavonoids, which protect cell structures from radiation and oxygen-based damage. Fight cancer in the kitchen with these delicious and fresh strawberry recipes! Chill strawberries in a bowl for at least 30 minutes, drizzle with balsamic and enjoy! Mix all ingredients in a pitcher and chill at least 1 hour before serving over ice.